Do you have young juvenile chicks, young pullets or immature poultry? Maybe older hens looking lifeless & lethargic? This product is a must for the chicken keepers / breeders First Aid cabinet. 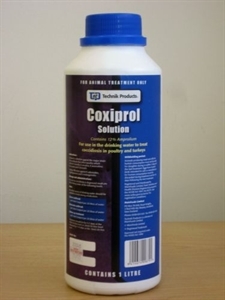 Coxiprol is an effective treatment against the major strains of Coccidiosis that can infect poultry. Coccidiosis is a parasite that lives in the soil that can effect Chickens and Turkeys. As immature poultry hasnt built an immunity, Cocci can be fatal to young poultry's health. How do you know if Cocci is present? Are your chooks lifeless, sleepy, have runny droppings, off their food? Not drinking and possibly blood in their droppings? Chances are this is Coccidiosis and without prompt and correct treatment, chances are your beloved chooks could die. Adult Chickens can also suffer with low grade Coccidiosis during stressful times, moult and generally when their immunity is down. Coxiprol is treated in your chickens drinking water. For a period of 5 to 7 days at a rate of 20 mls per 10 litres of drinking water. A follow up treatment is recommended at approx 1/2 this dosage. Tip: For really sick chooks, the mixture works great when added to feed pellets or dry mash to make a wet mash. Chicks choice, chick starter crumble for day old chicks through to 8 weeks of age.